Research in 2009 by the University of Oxford found that all forms of cancer were less common in those who eat plants rather than meat. Other studies have found the same. But are there particular green veggie friends who are especially…well…friendly to us? How much broccoli are we talking about? How long between chopping and cooking? Updated in 2014, the University of Oxford research indicated the highest level of protection was against blood cancers (leukaemia, multiple myeloma and lymphoma), with the incidence of cancer being around half in those eating a vegetarian/vegan diet. Vegetarian/vegan diets can be far from the optimal nutrition that’s found in a WFPB diet. So I have little doubt that when those eating WFPB diets are included in such studies, they will be the group with the lowest incidence of these awful cancers. The British Journal of Cancer thought in 2009 that it might be a good idea to do a bit of further research into this, but there was a body of evidence that already existed at that time, with more since, showing that greens are particularly good at fighting cancer and other chronic diet-related diseases. Cruciferous vegetables seem to be the ones we should be inviting to our daily meals on a regular basis. 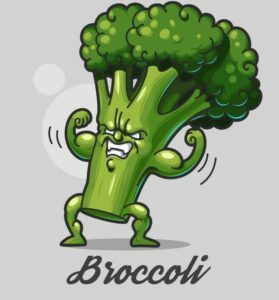 There’s a vast range of anti-oxidants and other micronutrients in all the above, but I want to concentrate on one vegetable, broccoli, that has a particularly powerful punch when its comes to the fight against cancer – sulforaphane – an active ingredient in all cruciferous vegetables. Sulforaphane has been shown to kill human leukaemia cells in vitro while not affecting healthy cells. But what about when the cells are in living people? A 2010 Yale University study showed that eating cruciferous vegetables in general was related to a significant survival rate in a group of subjects who already had non-Hodgkin’s lymphoma. The 2010 Iowa Women’s Health Study, found intake of broccoli and other cruciferous vegetables to be related to a lower risk of getting non-Hodgkin’s lymphoma in the first place. A 2012 Mayo Clinic study found that the risk of lymphoma was reduced in those eating lots of green leafy vegetables. A 2001 study found that broccoli and other cruciferous vegetables rev-up the ability of enzymes to detoxify the liver. A 2010 study found that broccoli was particularly effective at preventing breast cancer in premenopausal women. A 2010 study found that the sulforaphane in broccoli and Brussels sprouts reduced the ability of breast cancer stem cells to form tumours. In 2007 Johns Hopkins University researchers gave broccoli-sprout juice to women just before scheduled breast reduction surgery. After the surgery, when they dissected the breast tissue samples, the researchers found significant sulforaphane buildup. This proved that the cancer-fighting nutrients in broccoli actually do find their way to the right place when we eat them, and not just when they are poured over cells in petri dishes. And this is just a small selection of the research supporting the cancer-fighting power of broccoli and its cruciferous buddies. To get the same cancer-fighting results as the broccoli-sprout juice used in the John Hopkins University study, you would need to eat 12 grams of broccoli sprouts a day. And that’s a lot! Whatever I say about broccoli applies to some extent to all other cruciferous vegetables. Curiously, sulforaphane is not released for your body to benefit from if you simply chop and immediately cook it. You need to ensure that it gets a kick-start from the sulforaphane precursor compound (a glucosinolate called glucoraphanin – part of the plant’s natural defences against diseases and pests) that needs to mix with the enzyme called myrosinase, which is inactivated by cooking (even though there appears to be come cancer-fighting potential in broccoli that’s been chopped and immediately microwaved). This explains why it was shown that cooked broccoli is not as effective as raw broccoli in suppressing cancer-cell growth in vitro. Chopping or biting into raw broccoli is like snapping a chemical flare – the precursor of sulforaphane mixes with the enzyme resulting in the formation of sulforaphane as the vegetable is either churning around in your stomach before it’s digested if eaten raw, or waiting patiently on the chopping board if it’s going to be cooked. Luckily for us, even though cooking destroys the enzyme, the precursor and the final product (sulforaphane) are heat-resistant. This means that when cooking the broccoli, we need to chop it up and leave it for a while before cooking, so that the chemical “magic” can take place. Dr Greger talks about his aptly-named “Hack and Hold” or “Whack and Wait” technique. He suggests you chop the broccoli and then wait for forty minutes before cooking in whatever way you want – steam, boil, bake, microwave. The sulforaphane would by then have been made and the enzyme – destroyed by cooking – is no longer required. Prechopped or shredded broccoli can be cooked immediately (so long as it has not been previously boiled). If you are making a broccoli soup, blend the raw broccoli etc first and leave to stand for forty mins before cooking. Commercially-sourced frozen broccoli is usually blanched (flash cooked) and appears not to be ideal. (It was further demonstrated here and again here with frozen kale when compared with fresh kale.) But you can always “chop and freeze” to get the desired result. If you do buy frozen, you can put back the enzymatic power of myrosinase by simply sprinkling the cooked broccoli with a little mustard powder. Sounds odd, but it has been shown to work. Then it’s almost as good as eating it raw. Dr Greger calls it his “Mustard Powder Plan”. I have to admit, though, that I simply pre-chop the veg and wait for at least 40 mins before cooking. It all depends on how much time you have been preparing and cooking your veg. Other cooked cruciferous vegetables have shown similar sulforaphane-revitalising effects when sprinkled with mustard powder. Think of your cruciferous vegetables as friends or family that are invited to EVERY meal. Cancer incidence in British vegetarians. Key TJ, Appleby PN, Spencer EA, et al. Br J Cancer. 2009;101( 1): 192– 7. Cancer in British vegetarians: updated analyses of 4998 incident cancers in a cohort of 32,491 meat eaters, 8612 fish eaters, 18,298 vegetarians, and 2246 vegans. Key TJ, Appleby PN, Crowe FL, Bradbury KE, Schmidt JA, Travis RC. Am J Clin Nutr. 2014 Jul;100 Suppl 1:378S-85S. doi: 10.3945/ajcn.113.071266. Epub 2014 Jun 4. Vegetarians less likely to develop cancer than meat eaters [news release]. 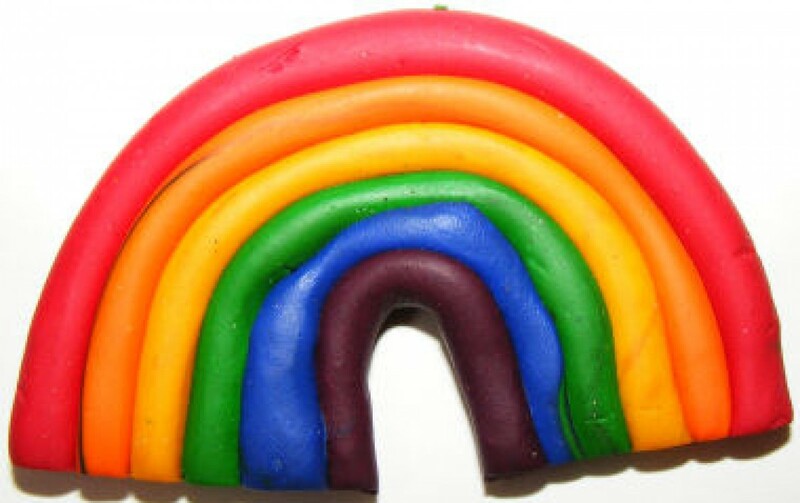 London, UK: British Journal of Cancer; July 1, 2009. http:// www.nature.com/ bjc/ press_releases/ p_r_jul09_6605098. html. Sulforaphane induces cell cycle arrest and apoptosis in acute lymphoblastic leukemia cells. Suppipat K, Park CS, Shen Y, Zhu X, Lacorazza HD. PLoS One. 2012;7( 12): e51251. Vegetable and fruit intake and non-Hodgkin lymphoma survival in Connecticut women. Han X, Zheng T, Foss F, et al. Leuk Lymphoma. 2010;51( 6): 1047– 54. Antioxidant intake from fruits, vegetables and other sources and risk of non-Hodgkin’s lymphoma: the Iowa Women’s Health Study. Thompson CA, Habermann TM, Wang AH, et al. Int J Cancer. 2010;126( 4): 992– 1003. 12. Food-frequency questionnaire-based estimates of total antioxidant capacity and risk of non-Hodgkin lymphoma. Holtan SG, O’Connor HM, Fredericksen ZS, et al. Int J Cancer. 2012;131( 5): 1158– 68. 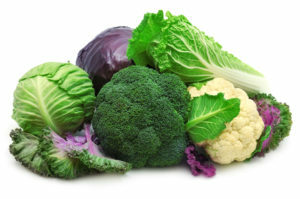 Effect of cruciferous vegetable consumption on heterocyclic aromatic amine metabolism in man. Murray S, Lake BG, Gray S, et al. Carcinogenesis. 2001;22( 9): 1413– 20. Fruit and vegetable intake in relation to risk of breast cancer in the Black Women’s Health Study. Boggs DA, Palmer JR, Wise LA, et al. Am J Epidemiol. 2010;172( 11): 1268– 79. Sulforaphane, a dietary component of broccoli/ broccoli sprouts, inhibits breast cancer stem cells. Li Y, Zhang T, Korkaya H, et al. Clin Cancer Res. 2010;16( 9): 2580– 90. Preclinical and clinical evaluation of sulforaphane for chemoprevention in the breast. Cornblatt BS, Ye L, Dinkova-Kostova AT, et al. Carcinogenesis. 2007;28( 7): 1485– 90. Broccoli sprouts: an exceptionally rich source of inducers of enzymes that protect against chemical carcinogens. Fahey JW, Zhang Y, Talalay P. Proc Natl Acad Sci USA. 1997;94( 19): 10367– 72. Bioavailability and kinetics of sulforaphane in humans after consumption of cooked versus raw broccoli. Vermeulen M, Klöpping-Ketelaars IW, van den Berg R, Vaes WH. J Agric Food Chem. 2008;56( 22): 10505– 9. Anti-proliferative activity and chemoprotective effects towards DNA oxidative damage of fresh and cooked Brassicaceae. Ferrarini L, Pellegrini N, Mazzeo T, et al. Br J Nutr. 2012;107( 9): 1324– 32. Greger, Michael; Stone, Gene. How Not To Die: Discover the foods scientifically proven to prevent and reverse disease, (Air Side Edt) (pp. 305-306). Pan Macmillan. Kindle Edition. Modifying the processing and handling of frozen broccoli for increased sulforaphane formation. Dosz EB, Jeffery EH. J Food Sci. 2013;78( 9): H1459– 63. Commercially produced frozen broccoli lacks the ability to form sulfora-phane. Dosz EB, Jeffery EH. Journal of Functional Foods. 2013;( 5) 2: 987– 90. 14. Antiproliferative effects of fresh and thermal processed green and red cultivars of curly kale (Brassica oleracea L. convar. acephala var. sabellica). Olsen H, Grimmer S, Aaby K, Saha S, Borge GI. . J Agric Food Chem. 2012;60( 30): 7375– 83. 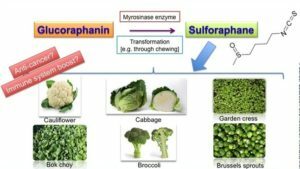 The potential to intensify sulforaphane formation in cooked broccoli (Brassica oleracea var. italica) using mustard seeds . Ghawi SK, Methven L, Niranjan K. (Sinapis alba). Food Chem. 2013;138( 2– 3): 1734– 41. 15. Previous Previous post: Does Prostate Cancer Screening Work?